Game of Thrones, The Vampire Diaries, Awkward, The Simpsons, Family Guy, Dexter, Suits, Orange is the New Black—oh my, there are an abundance of TV shows detracting from your attention to schoolwork. With exams around the corner and your favourite shows either ending or beginning (Game of Thrones, April 12! ), TV is a huge distraction. Some say it turns your brain to mush; some say TV is a tool for procrastination. Well, I say that TV is a great way to relax. Although keeping up with our favourite TV shows (Game of Thrones, I love you) is difficult during the year amidst assignments, midterms, tests, and readings, I feel relieved when I get a moment away from my textbooks to watch a show. No reading, no writing, no stressing. Another world, characters you feel like you know, and a plot-line that keeps you wanting more—TV is the perfect escape from our book-bound lives. I think that every student needs at least one TV show they love to watch to keep up with throughout the school year (ahem, Game of Thrones in the summer semester this year). If you don’t have a show to watch, ask your friends or Google for a suggestion. You could use the escape. Once you’ve found your magical TV show (or five, or Game of Thrones), start watching! I guarantee you will feel less stressed about your life afterwards. Fair warning: although TV is great for relaxation, an overdose or a binge-watch could be catastrophic for your looming deadlines. When it comes to shows, the watcher absolutely must be cautious about how much time they allot to watching episodes. Time management is essential here. Like any other relaxation method (the gym, meditation, food…), too much TV might put you in a time crunch for finishing that essay or studying for that midterm. Try using TV as a reward. For every two hours you study or write, you get to watch an episode. Or for every 50 minutes you study, you get to watch 10 minutes of an episode. Finishing an assignment and a series simultaneously has never been so easy. Personally, I follow two shows maximum at a time so I can put school first. So grab a blanket, a healthy snack, and some tea. De-stress and watch something! Have you ever wished for a giant list of study spaces that you can close your eyes, point at, and choose from? Have you ever wondered where to study in the library, or where you can pop open a book anywhere on campus and cram in some study time? Have you run out of ideas for where to study, or need more options for study space? If you answered yes to any of the above, I present to you a list of study spaces I’ve discovered during my time at UTM! Keep in mind contextual factors before choosing a study spot, such as if you are studying alone or with friends, if you need to work on a group project, how much noise you can tolerate, what time of day it is, how long you’re going to be there (ie. Do you need a place where you’ll be setting up camp for a few hours? ), how soon you need to get your studying done, and if you need an outlet for your phone or laptop charger, to name a few. – Check the schedules posted beside classroom/lecture hall doors to see if there’s a class inside. If not, and the door is unlocked, go forth and study! – Ask your friend if the prof will notice or care, or if it’s a large or a small lecture, first. In order to make this list “inexhaustible”, we need each other’s help. Comment below and add your favourite spaces to study, or anywhere that I’ve missed! I’ve learned in my life, now more than ever, that getting involved is difficult. Going out into the big, bad world and finding your way is eye-opening, motivating, and incredibly challenging. Hever, it’s important that students seek out new experiences because of all that they will learn about themselves. Personally, almost every quality that I’ve come to respect about myself was discovered from a completely new experience. My boldest endeavour: taking a trip to Kenya to contribute to a school building project. For someone who had only traveled outside of the country once in his life, it was a huge step. I was (and still am) quite shy, not to mention a little immature and naïve, but it turned out to be the greatest learning experience I’ve ever had. If you have yet to travel internationally, your first trip will be the most challenging and rewarding opportunity you’ve ever had. The inspiration to do something courageous is often sporadic and it always occurs differently for everyone. I look to one of the world’s greatest pop culture icons for motivation; I’m a geek, so it’s obviously not a singer, an actor, or an athlete. He’s a fictional character with girl problems, teenage angst, and super villains. You guessed it: it’s your friendly neighbourhood Spider-Man! 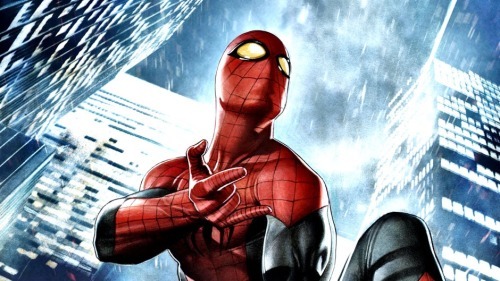 You’ve obviously heard the news: Spidey will be joining Captain America, Iron Man, and the other Avengers in the Marvel Cinematic Universe. It’s exciting news for everyone’s favourite wall crawler; fans will finally (hopefully) receive the Spider-Man movie we’ve been wanting for over a decade, which means the hero will be bigger and more popular than he’s ever been. That’s saying something, too—Spider-Man is one of the most profitable pop culture brands in the world, with over $1 billion worth of merchandise sold with his likeness last year alone. He’s a big deal for Disney, and an even bigger deal for millions of people around the world. Spidey isn’t my favourite superhero, but I would argue that he’s the greatest one. He’s imperfect but relatable, besides the fact that he has spider powers. More importantly, he overcomes and inevitably triumphs whatever hardships come his way. Be they super-villains or challenges with his girlfriend, Spider-Man keeps on keeping on stronger than ever. That’s what I admire about him; despite the odds, he doesn’t give up until he ultimately succeeds. Through personal tragedy, he forged his destiny as an under appreciated good guy with great power and the greater responsibility to do what’s right. He doesn’t do it for the fame or the glory (which, surprise, he doesn’t often get), but to honour a promise he made to himself after he refused to act selflessly. Spidey represents the power of the human spirit to persevere and inspire others, which leads me to believe that he’s the ultimate pop culture hero. The character is fictional, but he represents human qualities that are entirely real. His exploits invigorate me to get involved, even if that might seem downright impossible to do. But if Spider-Man can overcome, then I can too. Whoever serves as your inspiration, real or not, remember them when in pursuit of your goals. You might not have superpowers, but you’re capable of anything when you put your heart and soul into it. I want to work with non-profits in rural India. I would like to be that person at HarperCollins who gets to read manuscripts and goes on to uncover the next best seller. I seriously want to spend a good portion of the next 20 years backpacking across Asia and South America. I sometimes think there is no better career than being a religious scholar and understanding my faith inside out. I also know that I would be one happy girl if I could dedicate my life entirely to my family (the one I currently have and the one that’s yet to arrive). In short, I want to do too many things in too short a lifetime. Not to mention I have a set of worried parents who think their daughter has no goal in life. I remember my father giving me pep talks about the many virtues of an MBA back in grade six. There was no doubt in my mind that I would graduate in management. The catch: I hate math. I honestly thought I was done with math for good after grade 12. So I couldn’t bring myself to go through the ordeal of MAT133. However, no math equals no business degree. Meanwhile, science wasn’t even considered. I was destined for the humanities, but even humanities has too wide a scope for a person as indecisive as myself. And yet at the same time I still dream of taking over Procter and Gamble. But what is so wrong with indecision, really? My lack of ability to decide in due time does not hamper my success. It only delays it—for the sake of perfection. I like perfecting every detail. When I finally come to a decision, it’s almost always the right one. Don’t they say slow and steady wins the race? As for the matter of what I want to do with life, let me come out and say it once and for all: my only goal is to be a student of life. Excuse the cheese. Every single day that I survive is an experience unique to me. Believe me, in the end it will not matter what career path I chose. What will count is what I’ve learnt over the years. True wealth does not constitute how big your net worth is, or how many friends you have. True wealth lies in how well you have come to understand life. Wisdom is the single most important power in the world. I fancy working for non-profits so that I can understand the dirt and grime of our world. I hope to read manuscripts because I want to be the first one to benefit from a particular author’s understanding of life. I long to travel to as many countries as possible not so that I can brag about my adventures, but so that my education is not restricted to one little part of the world. People from entirely different cultures with entirely different histories can offer you more perspective on life than you ever imagined possible. I desire to study my religion because beneath every faith lies endless insight into what is right and wrong. So why not start with digging into my own? And where else is better experience of relationships to be gained than by spending time with your own family? Who do you love and appreciate most in your life? Family, friends, celebrities, and your personal role models probably come to mind first… but what about yourself? Do you truly love yourself for who you are, and not how you want others to see you? This has a little to do with humility, and a lot to do with what constitutes true and honest values towards personal identity. You’ve heard it all before, about loving yourself and not letting others change your perceptions of yourself. Easier said than done. We are all capable of putting up a façade of complacency and coolness in regards to how we view ourselves, but let’s not play around. What others think of us matters, and this affects how we feel about ourselves. Learning to love yourself takes time and effort and is probably still ongoing for us all. The process is different for everyone, although it usually involves discovering and embracing what you enjoy most. That was certainly the case for me, and it’s only been a recent occurrence in my life. I was (and still am) a quiet individual, so I didn’t get as involved in school as I would’ve liked. My childhood was happy, but not very exciting—lots of video games, comic books, and creative expression. However, this lifestyle didn’t completely satisfy me. I saw my friends play sports and go on exciting vacations while I was stuck doing the same old stuff. What I loved to do just didn’t seem like it was enough, which made me doubt myself. Attempting to compensate through name-brand clothing and a cocky attitude didn’t help much either. I didn’t appreciate who I truly was, but who I thought that I wanted to be. Although I don’t accept everything about myself completely, as there are always aspects of ourselves that we can improve, I do appreciate the strengths of my character. Through volunteer opportunities and roles of responsibility, I learned to exercise my creativity and my desire to make the world a little bit better. Although I enjoy quiet time, getting involved in the community taught me that I was more capable than I realized. This newfound confidence allowed me to explore more international experiences and challenge myself. Learning to love yourself starts when you accept your weaknesses. I’m skinny, awkward, geeky, pretty weird… but I’m okay with those traits, because they define who I am right now. That doesn’t mean that I don’t want to improve, but I recognize that I can embrace my quirks and still achieve success. I love myself—moderately, of course. I know that I’m unique and have important ideas and skills to offer. That can be for you as well. If you recognize your own faults but still challenge yourself in spite of them, then you deserve to be proud of yourself. Get involved, embrace your passions, and you will be rewarded. Love others, and you will be loved… but learn to love yourself, too. Have you seen the elections posters in the Meeting Place? Yes, you know, the ones all over the stone pillars while you drink your coffee. The colourful long sheets of paper with the smiling faces and the “Vote for me for this position!” signs. Have you ever stopped and read one of the posters? They are all the same—someone is marketing themselves for some position that the majority of the student body doesn’t know exists. Components of a candidate’s poster? You’ll find a picture of the candidate with their arms crossed, or awkwardly dangling at their sides, smiling at you. There’ll be two headings that stick out: their name near their face and the name of their sought position at the top or bottom of the page. And let’s not forget about the bubble containing what that candidate will “lobby for” or “fight for” or “advocate” in their given position. I think that it’s more important to know what these people are running for than who is running. Let’s walk through what kinds of elections happen at UTM, wherein students sit on councils and “lobby for” things. We all go to UTM; we might as well know and participate in running our campus. From what I gathered from their meeting agendas obtained through a quick Google search, the following councils and committees have meetings to decide if some change or other should happen on our campus. There seems to be presentations, some discussion, and voting. Governing Council: elections are now over, I think. The highest decision-makers at UTM/U of T. Oversees all of the other councils. Campus Council: elections are happening, I think. Council overseeing UTM’s affairs on behalf of the Governing Council. Academic Affairs Committee: elections are happening, I think. Makes decisions on anything concerning academic policies and teaching and research at the university, like how programs are run and what programs are offered. Campus Affairs Committee: elections are happening, I think. Deals with campus life and campus resources. So basically, the students running for these groups follow the given agenda and represent our voice in major campus decisions through formal discussion and voting. Students’ Union (UTMSU): elections are coming—check your email for updates because UTMSU always opts for email communication. The students’ union represents us—where our money goes, what services we get, and hosting or organizing a lot of campus events. From what I’ve gathered, there is the position of the president and then a bunch of VPs—external, internal, part-time, campus life, academics, and equity. As for when you vote for UTMSU, don’t be discouraged by the pressure the candidates put on you in the hallways. Just keep in mind that these people represent you somehow, and choose accordingly. And don’t be afraid to ask why they are running or what they plan to implement, or what happens at their meetings, or even what any of it has to do with you. As a side note, clubs also have executive teams where you can vote for who will run a specific club. Most of these clubs are structured in the same president plus VPs format. There are also board of directors elections for larger clubs, including the UTMSU. The board of directors is the group above any given club and makes decisions about the club’s funding and format. So this coming elections season, do your research and ask candidates what they are running for. I hope that some of my observations will help you in your votes.